A “TOURNAMENT ONLY” option is available. and is not eligible for Early Bird Refund or team gift. Note: Full packages include HOTEL, GROUND TRANSPORTATION and TOURNAMENT FEES and must be taken as presented. Please, no requests to modify, alter or delete portions. Souvenir T-Shirts A souvenir T-Shirt is included in the package price. 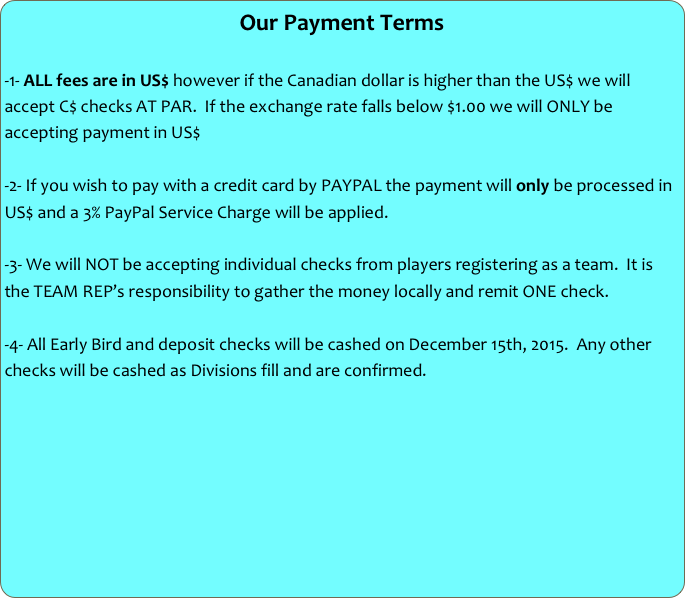 Tournament Only Participants wishing to purchase a T-Shirt may do so by pre-order only for $10 See Size Chart Here. Items MUST be ordered and paid for no later than March 15, 2015 to guarantee availability. Unfortunately, due to the high exchange rate between the C$ and US$ we have put this event on hold. We will consider holding this event again should the exchange rate rises again.